2 Grand Cru: "Thank you, for your wines, California"
"Thank you, for your wines, California"
I admit one of the reasons that I am not a fan of US wines is my limited exposure. While I may be a truculent Old World admirer, it is a folly to ignore an entire continent and if I was living on the west coast, I'm sure I'd find many wineries that appeal to me. So I am glad I took the opportunity to taste through an admittedly very limited selection of wineries: two venerable estates purporting to adhere to Old World ideals - whatever that may still mean decades after the Trial of Paris and all the changes the world of wine has seen since - and one, a sort of latter day boutique negociant looking to make "the kind of wines one could drink every night with dinner, regardless of season." This is a historical winery, whose vineyards, planted with vine grafts brought from Burgundy in the 40's (fortunately, before the days of the "bad clones" in the 60's), are located on high, steep hillsides. The winery is into sustainable agriculture, organic practices, an elegant Burgundian winemaking style - all the marketable buzzwords, in short. Somehow, though, I was left underwhelmed. Good wines, for sure, but they did not captivate me on an emotional or intellectual level. Thirty year old vines. Flint, some oak that fades. 6 months in neutral barrels. Lithe and salty despite the oak. Warms up nicely. 36 USD. Heavier, yet fleet of foot, the oak more obvious, even though I'm sure it will integrate. Complex mineral aromas dominated by flint, with apples rather than the Sebella's citrus fruit. I bought a bottle of the Sebella for its friendly charm, but stalled with this top tier Chardonnay, because it isn't this charming now and its price point was too much for me to gamble on potential - my lack of familiarity with the style might be an issue here, I just couldn't make a confident guess and there was no electric vibe tempting me the way white Burgundies do. 78 USD. Interesting herbal aromatics, sandalwood and red fruit adorn an elegant, subtle structure. I'm not sure if the price is worth it, but I like its subtlety and I see potential. Not Bourgogne but definitely a Pinot I like, but, at t 98 USD, not enough to buy. 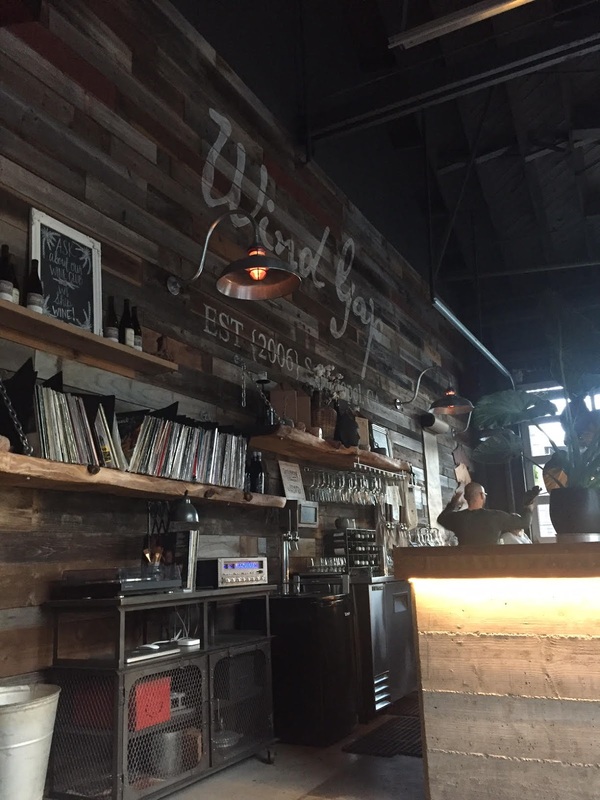 I guess many would make that claim and I always suspect wineries with a million labels (such as Wind Gap offer), but the Syrahs are terrific and the Trousseau Gris is a unique gem. I tasted two flights at the tasting room and at the end of the day, this is exactly the sort of winery I'd follow if I were a local. I highly recommend it to travelers and local importers. The Syrah Flight: Whole cluster, good acidity in all, with fresh fruit that could turn wholesomely meaty in time, in some cases already showing that now. Good backbone here, subtle yet with a more prominent presence at the finish. An almost Pinot-ish softness and a welcome greenness that took me a while to pinpoint as tobacco leaves. Weighs in at 10.4% but you would never have guessed it. 12.5% ABV. Ripe fruit that veers to black and blue while retaining attractive freshness and even greater structure. Excellent. More tannic and not as friendly, but the nose has additional accouterments, adding meat and smoke. It's a toss up between it and the Nellessen. A blend of the above three vineyards, it's the most approachable and right now paints the most complete picture, with the Syrah regalia of black pepper and captivating blueberry fruit. Then we went through a flight of the more esoteric wines in the portfolio. An erratically rebellious white/orange wine (limited skin contact), with Pinot aromas, marginal tameability and pungent mineral aromas (imagine a salt bath in the background). This is a tamer wine - I mean, there is a mineral streak here as well, but with less bite and bristle. The citrus acidity makes it moreish, but while it warms my sardonic heart that someone found a way to make Dolcetto appealing, the Trousseau totally outshines it. Seven different varieties (I caught Zinfandel, Petite Sirah, Carignan from the winery guy's spiel as he poured it for me), whole stem, carbonic maceration. Meaty and fun, short though. Reticent. I get, just barely, white and black pepper. The candied nature of the grape is subdued. I don't know what to make of it yet. By the way, the vines really are very old, over a hundred years old. The Syrahs and the Grenache are 30-40 USD, as I recall. I didn't note the price for the others. This is another historic winery, family run, specializing in Pinot and Syrah. 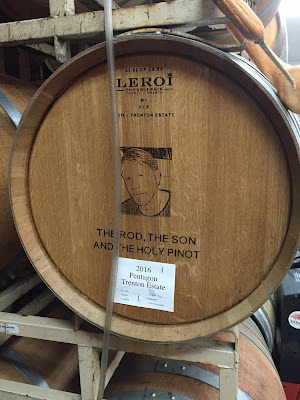 I loved their flagship Pinot, the single vineyard Trenton Estate, which the family planted about forty years ago; sadly, I was indifferent at best about most of the rest. Alcoholic, band aid, stings. 13.8% ABV. Formally higher ABV (14.2%) but less obvious and better balanced, with mildly appealing spicy aromatics. I'd drink a glass or two. Very much a New World Pinot, it has the spices and forest floor that I love, but it's fat and feels ripe even though it comes from their coolest site. I don't find it particularly balanced - I think the fruit just isn't concentrated enough to shine through, despite the ripeness. Intended to represent the Russian River AVA, there is additional weight and substance to the fruit here, more tannins as well, here that serve the wine well, even though I can't really appreciate Pinot at 14% ABV. The earthiest, most Burgundian Pinot of the lot. Premier Cru level and even the ABV is sane at 13%. I am highly in favor of the notion that this is the best US Pinot I've had. A huge wine, too huge for me. Meaty and packed tight, alcoholic (15% ABV) and mean.